Many of the shore species that attract the attention of the 'rockpooler' are specially adapted to the conditions in the shallow seas in which they spend their lives. They have evolved an external appearance different from the open-water fish like the Pout Whiting (Bib), Trisopterus luscus. A 'fish' is defined as an aquatic vertebrate without limbs, but with fins and gills, that swims in water1. The earliest known animal in the fossil record to resemble a fish is called Pikaia; this worm-like animal had a supportive notochord of fibrous tissue (a primitive backbone) and lived about 550 million years ago in the Middle Cambrian period. About 450 million years ago, during the Ordovician period, the first jawless fishes, the Agnatha, evolved. The British marine fish called the Blindfish, Myxine glutinosa, belongs to this group has hardly changed for 340 million years. This fish is washed up on Scottish shores, and lacks vertebrae, fins and scales, and so that it resembles a worm in external appearance. The development of jaws was an evolutionary breakthrough, and occurred about 400 million years ago during the Silurian period. The earliest sharks were amongst the first 'jawed' vertebrates. Sharks and related species are classified as Chondrichthyes, which means 'cartilage-fishes' because that is what their skeleton is made of. They developed their modern form about 360 million years ago. Modern sharks are classified in the subclass Elasmobranchii. The rockpooler is most likely to come across the modern fish classified as Osteichthyes, meaning 'bony fishes', which have evolved a skeleton of true bone. Their origin dates back to the Silurian, and since that date they have evolved in to many diverse forms to occupy habitats in the sea and fresh water lakes and rivers. Over 23,000 different species have been identified. The majority of species are grouped in the subclass Teleostei, with more complex vertebrae, and with a skin usually protected with scales. Most teleosts can keep neutrally buoyant when stationary in mid-water by the use of the swim-bladder, whilst sharks lack this organ and need to keep swimming or they will sink to the seabed. 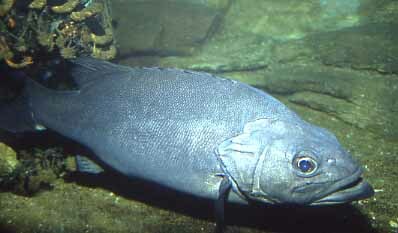 The swim-bladder enables fish to cope with the pressure at different depths, and is not needed in many littoral fish. Water is a dense medium2, about 830 times as dense as air, and has a greater viscosity, about 60 times that of air. This means that although marine life does not require the supporting skeletons of land dwellers, water is more difficult to swim through. Because of this fish and other marine animals have developed shapes that minimise the resistance. This is seen clearly in the bony fish. The most efficient swimmers are streamlined forms like the Mackerel, Scomber scombrus. However, many of the shore and rock pool species have evolved a life style that does not require them to swim at speed or over great distances, and it is interesting to watch how these fish swim in aquaria. Fish are not rigid; the body flexes to some extent in all fishes. This is noticeable in the snake-like wriggles of eels and the Tompot Blenny, Parablennius gattorugine. In the Bass, Dicentrarchus labrax, it is the caudal peduncle (in front of the tail fin) that flexes and the Bass propels itself forward with powerful flicks of its tail, with its other fins clamped down to reduce drag. The other fins control the effects of the undulations of the body, and as the fish brakes the dorsal fin is raised. Pectoral fins can be used both for propulsion as in the wrasse and steering, when these side fins are exceptionally large as in the Bullhead, Taurulus bubalis. What is the fastest fish in the sea? This has not be established with certainty because of the difficulties of measuring the speeds of fish. The fastest are likely to be very powerful large fish that have a streamlined aquadynamic shape. These include the Tunnies (Tuna) that actually prey on the swift smaller Mackerels.The favourite for the fastest fish is the Sailfish, Isitiophorus platypterus. Fish breathe through their gills, extracting the small amounts of dissolved oxygen in the water3. They need water constantly flowing over them, inhaled through the mouth, and expelled from under the operculum, or gill cover. The fish can control the amount of water passing over the gills4. This can be important in shore fishes, because water conditions and the oxygen content of rock pools are variable. The same applies in aquaria, where the increased respiratory rate of fish like the Blenny, Lipophrys pholis, can be clearly seen as the oxygen content of the water falls. This fish will also leave the water to absorb atmospheric oxygen through its skin. Colour is rarely an infallible guide to identifying fish species. Many species regularly sport differing colours. Fish found on the shore are remarkable for their ability to change their hues to merge in with their surroundings. The eyes operate as a sensory organ, and transmit messages to the brain, which influences the colour cells within the skin. There are three types of colour cells, containing melanin, responsible for enhancing (by expanding the cells) the black, brown, and grey pigments; carotene for enhancing red, orange, and yellow; and guanin, for enhancing white or silvery colours. The cells can also retract, reducing the importance of the respective pigments5. Flounders, Platichthys flesus, and other flatfish are noted by their ability to vary their colours on the uppermost part of the body according to the sea bed on which they rest. These can be seen in a special display at Plymouth Aquarium and, probably, other Public Aquaria. Most fish do not change colour rapidly, and will be coloured according to the environment in which they live. The silvery sides of open water fish are particularly difficult to see when viewed from the side through over a metre of sea. Fish of the weedy areas like some wrasse are greenish, whereas the Bullheads, Taurulus bubalis, will be a brownish colour to match the rocky areas in which they are found, and their colours are known to vary in different habitats because of the different colours of the bedrock. Sexes are separate in most species of fish. In nearly all the teleosts, the eggs are shed into the sea and are then fertilized. There are major differences in the number of eggs laid. Shoaling species congregate in huge numbers at regular locations at approximately the same time each year, where the female fish liberates millions of eggs and the male deposits sperm into the same water, where fertilisation occurs because of the close proximity of the sexual products. The fertilised eggs form part of the plankton, where they are heavily predated upon. In contrast, many of the shore fish e.g. Butterfish, Pholis gunnellus, lay their eggs in clumps of a few hundred. The eggs are fertilised and guarded by the male, until they hatch about one month later. The time is dependant on the species, the sea temperature and other environmental factors. In all elasmobranchs (sharks and rays), fertilisation of the ova (egg) takes place in the body of the female. This involves a sexual union. Some species are viviparous like the Smooth Hound, Mustelus mustelus, with the embryo retained in the mother's body nourished by the pseudoplacenta, but most British live-bearing sharks are technically ovoviviparous, with embryos nourished by egg yolks, e.g. Monkfish, Squatina squatina, that produce litters of between 9 and 20 miniature replicas of the adult form. Others like the Common (= Lesser Spotted) Dogfish, Scyliorhinus canicula, a small benthic shark of the eastern Atlantic and Mediterranean, lay their eggs, and carefully position the egg capsules, which are fastened securely to rocks and weed in areas of strong currents. Occasionally the capsules, known as Mermaid's Purses, break loose and can be found washed ashore (see page 10). Dogfish are rarely found between the tides, but together with the Thornback Ray (=Roker), Raja clavata, are exhibits usually to be found in Public Aquaria. The Monkfish is flattened like a Plaice, indicating its bottom-dwelling habits. Important bony fish (Teleosts) inhabiting the coastal zone around the British Isles include a family of typical rock-hugging fish known as Blenniidae which are found in the same type of habitats throughout the world. The Common Blenny (=Shanny), Lipophrys pholis, qualifies as a fish that has ethologically adapted to a littoral life, with a tendency to leave the water at low tide when the pool conditions deteriorate. It preys mostly on small creatures like acorn barnacles which are extremely abundant in the intertidal zone, and amphipods and small crabs that are in plentiful supply. The small fish family Gobiidae is represented in the shallow seas around Britain by five species that are regular shore inhabitants, and a few others that are also found during part of the year. They are difficult to spot at first, and tricky to identify. Most of this family inhabit sandy areas. The female Dragonet, Callionymus lyra, can be mistaken for one of the larger Gobies, with a sandy mottled body merging in with its surroundings. The male fish has an extremely long dorsal fin. Other fish of sandy shores include the burrowing Sand-Eels, Ammodytidae, the Armoured Bullhead, Agonus cataphractus, and the Lesser Weever, Echiichthys vipera, with a venomous black dorsal fin. The latter fish is found in the shallows and can inflict a painful sting on anyone unfortunate enough to step on one. Flatfish typify the fish of sandy bottoms, their form acquired after the juvenile fish has completed its planktonic existence, and begins to live on the ocean floor. As expected their food consists of worms, burrowing molluscs, and shrimps that share the same habitat. Flounders, Platichthys flesus, venture into estuaries during summer; their outline can be seen more clearly when they leave their semi-buried positions to swallow ragworms which feed near the surface of the mud on the arrival of the incoming tide. Soles, Solea solea, are very common in the English Channel in late summer over soft sand substrates just below the low water mark. They grow rapidly in the next two months. Juveniles of the more common flatfish are frequently found between the tides, the Dab, Limanda limanda, the Plaice, Pleuronectes platessa, and the Brill, Scophthalmus rhombus, being the most likely finds. Other flatfish inhabit rocky terrain, including the Lemon Sole, Microstomus kitt, mostly from northern Britain, and the small shallow water Topknot, Zeugopterus punctatus, which is an uncommon find in shore pools of the south-west. The brown Rocklings are members of the Cod family (Gadidae), distinguished by a number of barbels on the snout and chin. There are several species to be found under rocks and in shallow pools. The most commonly encountered is the 5-Bearded Rockling, Ciliata mustela. They will be found on rocky shores with sand, more often in shallow depressions under rocks than in the deeper pools. Often observed in large shoals around piers and jetties, the fry (postlarvae) of many different juvenile fish, including the silvery fry of members of the Cod family, can be seen near the surface during the summer months. The exact species will depend on the location with young Saithe, (=Coalfish, Coley) Pollachius virens, the most familiar in Scottish waters, and the Pollack, Pollachius pollachius, the prevalent species in Devon and Cornwall. Young Whiting, Merlangius merlangus, also shoal inshore to feed. This article is intended to give the flavour of small fish watching on the shore and from piers and jetties in estuaries. I have avoided listing the fish likely to be found because these will vary according to location, and it would be interesting to receive reports of the common inshore fish from various estuaries and sheltered bays around Britain, including observations from divers. A report of the common shore fish from Sussex will feature in an article in Glaucus during 1997. 1 Amphibians would also qualify under this description for the early parts of their lives, and a few never transform into their adult form. Therefore, the definition should exclude amphibians. 2 The density of pure water is approximately 1,000 grams per cubic centimetre (g/cm3). Seawater is about 2.5% denser than pure water. Specific gravity is the ratio of the density of the liquid, e.g. seawater, to the density of pure water, e.g. 1.025 at 1.000 g/cm3 = 1.025 S.G., 3.4% salinity at 15oC. 3 100% saturation of dissolved oxygen at 3.4% salinity at 16oC = 7.9 mg/l (ppm). Higher amounts of oxygen are found in fresh water, and lower amounts as the temperature of water increases. 4 For more information of how fish breathe see "How Fishes Live" by Peter Whitehead, Chapter "Life Under Water", and "History of Fishes" by J.R. Norman, Chapter III "Respiration". 5 Simplified explanation of how colour changes occur in fish that lacks precise accuracy. We hope to include a more detailed explanation and references in a future issue of Glaucus.